The A.K.E.A. is pleased to announce that once again, we will be co-hosting our annual Kobudo Camp with Sensei Shihan Crayton Moss, a 7th degree black belt with the A.K.K.W. 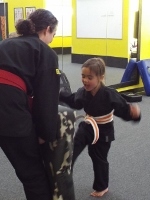 Dr. Moss started training in martial arts in 1974 and is an expert in Kobudo, the traditional weapons of Okinawa, Hawaiian Kenpo, and Okinawan Karate. 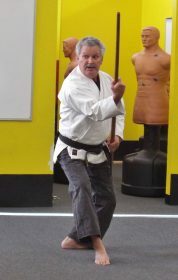 He has been traveling to Auburn for more than a decade to train our students in Kobudo. He has also recently begun teaching our students and instructors in traditional Okinawan Karate as well. You do not want to miss the opportunity to train with Dr. Moss. See the flyer for more information on how to register. Two workshops have been added to the April schedule! On Friday the 27th, from 6:00 to 8:00, Mr. Moore will teach Fighting with Forms Workshop which will focus on one of the Okinawan forms. Students do not need to know the form in order to attend. For additional information, please check with your instructor. 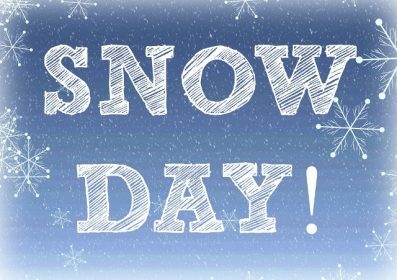 To err on the side of caution, this evening’s groups are cancelled. With the concern that roads will start to refreeze as the temperature drops, we want our students to be safe. It is a great honor and privilege to announce the promotion of Sensei Craig Moore to Director of Curriculum Development and Implementation for the A.K.E.A. Sensei Moore has proven over the years that his desire to advance the skills and perpetuity of the A.K.E.A. is his own mission. I have confidence that anything he brings to the school will benefit beginning, intermediate, and advanced students alike. 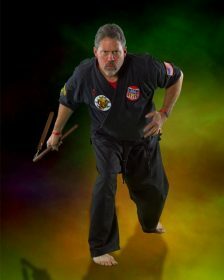 He has written a foundational Escrima book, as well as developed programs and curriculum that cover the entire range of rank skills. His managing of the school in its early days makes his direction and guidance to instructors an invaluable resource. Thank you, Sensei Moore, for accepting this position. It is with mixed emotions that we say farewell to Sensei Ken Tork, Sandan here at the A.K.E.A. Mr. Tork will be investing his time with work and family preparing for a new chapter of his life. Sensei Tork’s time at the A.K.E.A. has been invaluable as a student, instructor, and contributor to the high standards that we set for our school and instruction. I have known Mr. Tork since the 90s when the first school opened in Auburn, as one of the first students to begin training. Throughout this journey, he has shown the dedication and commitment to making his skill and that of his students exceptional. He has brought many students to black belt over the years; Mr. Tork challenged and guided them with what each needed to be successful. Mr. Tork’s fighting group has been legendary drawing consistent high attendance. Mr. Tork has seen changes in school management, locations, instructors, and students, all the while remaining stalwart and steady to give us a sense of stability. Professionally, his desire for excellence will be long remembered. We make bonds here as instructors. Personally, Sensei Tork is my friend. I have traveled roads of tragedy and triumph with him. I’ve seen him create hope for others all over the country out of his own personal loss. I’ve prayed with him and tried to encourage him through rough times, but in actuality he ended up encouraging me more. All instructors over the years have been touched positively in many ways by Mr. Tork. Sensei Tork, you will be sorely missed. I know that you will stay in touch as much as possible. This lame attempt to honor you is very inadequate. What I’ve shared with you over the years is beyond words. I’m not going to say “goodbye”. I will offer you the famous farewell of a great warrior – “live long and prosper”. I have the known Mr. Tork since he joined the A.K.E.A. somewhere around late 1994/early 1995. At that time the school was located out in North Auburn in a small storefront. He was part of a group of die-hard gung-ho advanced students that came to my advanced group every Wednesday. There were about a dozen students and groups were intense with bruises and bloody noses being fairly common. Mr. Tork was always there, and I knew even then he was a special student. A couple years later, I had the immense privilege of becoming his private instructor. Later on, he become one of the instructors teaching for me at the school. It was during this time that my respect for his dedication and commitment really grew. We would often drive down to Oregon together to complete in tournaments. and Mr. Tork almost always finished in the top 3 for sparring in his divisions. As instructor he is second to none. 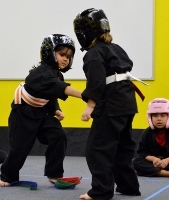 Students have always appreciated his commitment to teach real life self-defense. As students are getting ready for their black belt test, there is no one I would trust more to get them ready. I have always had complete confidence in him, and I know that there is nothing more important to him than the development of his students. He has always given 100% to them. We have been there for each other, at both our high points and our low points in life. At one point I had to step away from the school for a couple years, and it was Mr. Tork that sought me out and convinced me to come back to the school. Over the 20+ years we have training and taught together, Mr. Tork has become more than just a student to me, he is someone I count as a friend. I understand that sometimes life has a ways of interfering with your plans, but I have every confidence that Mr. Tork will continue his journey in the martial arts. 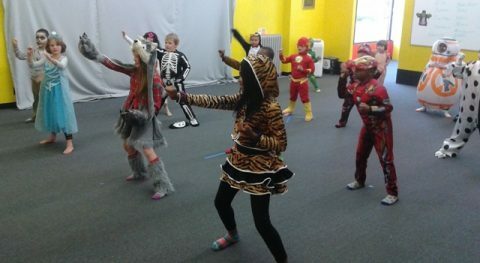 A great time was had by all – students, parents, and instructors alike. Thanks to Mrs. Brengle for all her hard work in organizing this fun event. Big thanks to Mr. Allen, Mrs. Carle, Mrs. Gallentine, and Mr. Remillard for their help. 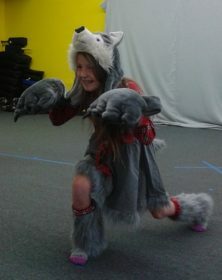 Congratulations to Most Fierce, Miss Carrera, aka Wolf Girl. 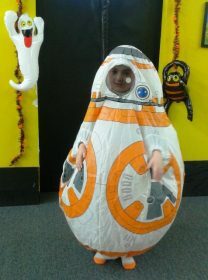 Congratulations for Best Costume, Mr. Slavin, aka BB8. Congratulations the Pumpkin Patch winner, Mr Oguakwa II. 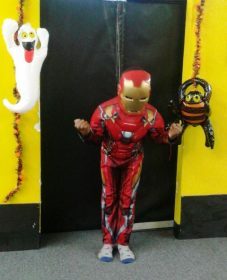 For more great pictures, take a look in the gallery. Mr. Remillard is offering this workshop for any student 15 and older. It is open to all belt ranks. Don’t miss it! Friday, Oct 20, 6:00-8:00. Training with pads will allow you to go beyond sparring, where you need to use control. Pad work will allow you train to fight at full speed and full power. This pad holding workshop will teach students how to properly and safely hold pads, as well as how to train to punch for self defense. Training with pads will improve punching power, punching speed, reaction time, targeting, and timing.